is a food microbiologist at the University of Ghana and involved in the AAUN research projects ‘Food Security and Antibiotic Resistance in the Chicken Processing Industry in Australia and Africa’ and ‘Monitoring and modelling of food security practices from retail to home in Australia and Africa’. African Women in Science and Engineering – an online platform that highlights the progress of the African Woman Scientist and Engineer. 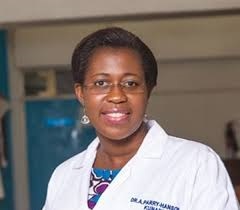 AAUN got in touch to find out what the Network has meant for Dr Parry-Hanson Kunadu in terms of support and opportunities. In the AFRICAN WOMEN IN SCIENCE AND ENGINEERING interview you were asked to comment on the topics of fundraising, networking and mentorship: essential affairs for researchers. Do you feel the Australia Africa Universities Network has offered you support and opportunities in these three areas? As part of the first physical meeting of the team, I was encouraged to put in a proposal to the International Foundation of Science (IFS) to conduct research in Ghana under the broad project theme “Monitoring and modelling of food security practices from retail to home in Australia and Africa”. Discussions at the physical meeting shaped the research questions and design for proposal development. I was fortunate to have received the grant and the research is underway. Though it is a small project, it has contributed to shaping my research focus as an early career scientist. Interactions between team members through emails and the physical meetings built trust, respect and appreciation for each member’s expertise. Through working as a team and interactions at the AAUN conference, I was introduced to seasoned researchers in Africa and Australia who share similar interests with me. In fact, it was at the meeting that my interest in antimicrobial resistance and risk assessment studies were birthed. Since then, I have been able to visit one of the project partner’s, Dr. Ivan Mukisa at Makerere University, who I did not know prior to the AAUN project. My visit strengthened the linkage and interest to collaborate further. Also, the team leader and Africa lead are planning a visit to my laboratory for the first time at University of Ghana to buttress partnership efforts, which will hopefully extend to other faculty members at my institution. The invitation to join the project team was as a result of my relationship with my mentor, who was also my PhD advisor. I have received informal mentorship in various ways from team members. Some ways I have benefited include guidance on research design and concept formulation. Through the IFS project, I have also been able to mentor young men and women through training, counselling and challenging them to find innovative solutions to food security problems in their society. AAUN acts as a catalyst for collaboration, forging fruitful links across disciplinary and geographical boundaries. Researchers seeking to expand their horizons scout out peers working in complimentary areas across the Network. I was fortunate to be in a group that worked well together and had good leadership. The seed funds granted by AAUN was used to organize annual meetings were members deliberated on project scope, structure, strengths and capacities of each member and their institution, and how we would work together. We left each meeting with defined roles and corresponding timelines, including proposals to develop and submit to prospective calls. Physically meeting at a central location was critical to the success of the project. At each meeting, the various expertise of members aided in shaping research concepts into feasible projects. What do you think are the greatest strengths of, and opportunities for, the Network? The AAUN fosters international collaboration among researchers and academics to find sustainable solutions to significant challenges limiting growth and development on both continents. The AAUN, through its seed fund and post-doctoral grants has been instrumental in driving research and innovation, capacity building and bench-marking among Higher Educational Institutions in Africa and Australia. This is a great strength in developing partnerships to aid research and development for global impact. The annual conference in Africa further enables the networking and knowledge sharing among diverse groups. One of the challenges project teams face, is how to sustain the links especially when the team is unsuccessful in securing joint funding within the duration of the seed fund. I am happy to see the postdoctoral opportunities that were opened last year to sustain some of the teams. More of such programs are needed to jointly secure high level funding to conduct research of relevance to both continents. AAUN researchers, please contact AAUN Program Manager Ms Marije Nieuwenhuis as we are keen to feature you and your work on this website, with the aim to support fundraising for further research.